I shared this cute Spring inspired necklace over at My Favorite Finds a couple of week ago. I'm going to show you how to make a decorative pendant finding...its really easy! Jewelry wire (mine is 20 gauge) and pliers. 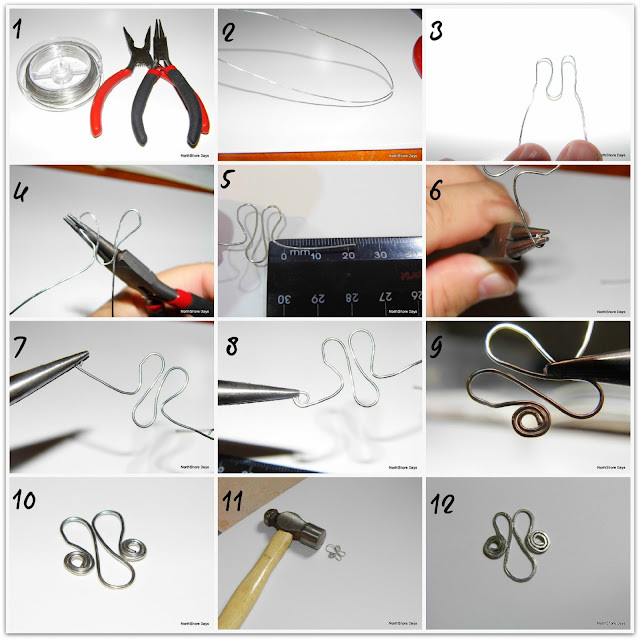 Cut a length of wire, bend in half carefully and begin to shape into an "M". Play with your wire a bit until you are happy with your design - but make sure that each side it pretty much a mirror of the other. When you have the design you like, cut each end to the same length. To make the coil, bend the wire around the pliers till you have a circle. Grab the circle with the pliers and carefully wind around the wire until there is a coil, try make it as tight as you can. Repeat for the other side. Then the fun part...you are going to strengthen and flatten the finding using a hammer. Hammer until the wire is flat - it will be really durable now. To make the rest of the necklace... I decided to make 3 dangles hanging from the finding. I made 3 chains, of different lengths, with beads and charms. Attach the chains to a jump ring and loop onto the pendant finding. Once the chain and beads are assembled, attach the necklace chain to each side of the finding and its ready to wear! I made my necklace long, but of course any length with any combination of beads would look great with this technique..
Oh Natalie - their just beautiful - the colors! Wow - you're talented! Pretty I have to play with wire! eBay I need to shop! So pretty. I seriously sit and stare at what you make and your tutorial and I think, how does she do it? Beautiful necklace and awesome tutorial! Love it! This is so pretty, Natalie. You always create the most beautiful pieces. Pinned :) btw...you rock the tutorials!